Lactic acid buildup in muscles causes the soreness you experience after a workout. Lactic acid, a waste product of the conversion of glycogen into energy, accumulates when your body experiences oxygen depletion. This occurs primarily during anaerobic exercise such as weight lifting or sprints, unaccustomed vigorous exercise or if you overexert during aerobic exercise. Conditioning your body with regular exercise makes it adapt to meet its oxygen needs. In time, less lactic acid will form in your muscles. Cooling down with light activity and static stretches gets rid of excess lactic acid. Exercise regularly. Perform both aerobic exercise and strength training each week. Aim for 20 to 30 minutes of aerobics daily, such as walking, rowing, jogging or aerobic dance, and at least two 20-minute sessions of weight lifting per week. You'll experience less excess lactic acid through regular exercise than if you only workout sporadically. Cool down at the end of your workout. In swimming, perform a recovery swim at a slow pace. After power walking, jogging, or lifting weights, walk at a slow pace. Cool down for five minutes or until your heart rate returns to normal. Cooling down gets rid of lactic acid in muscles. Perform static stretches. After you cool down, perform static stretches. Stretch the muscles you've been using by reaching as far as you can and holding the stretch. For example, put one foot on a bench and lean over from the waist. Grasp your foot or as close as you can reach and hold the position for a slow count of 10. This stretches your hamstrings. Static stretches get rid of excess lactic acid in your muscles. 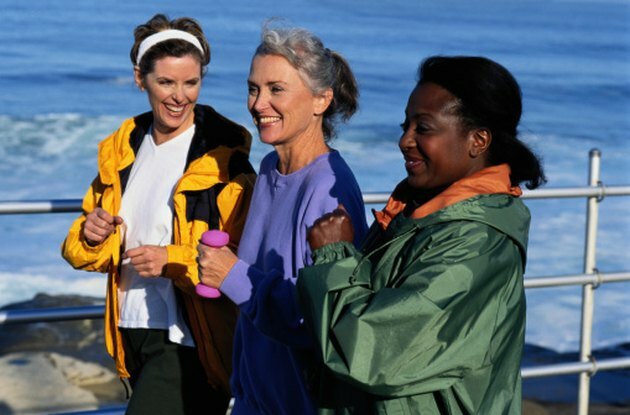 Check that you can talk comfortably during aerobic exercise. If you're out of breath, you're working anaerobically and your muscles produce more lactic acid. Don't bounce when you stretch. Taking a bath with Epsom salts can help relieve muscle soreness. Consult your doctor about any medical concerns. Start slow on your exercise program if you've been inactive.